It's was a disaster waiting to happen, active Volcano Kanlaon in the Philippines which had shaken with 2,234 volcanic earthquakes on Thursday and Friday, along with a coronal hole on our Sun, spewing solar wind towards Earth and tropical storm Kai-Tak battering the volcano's vicinity with severe winds and torrential rain over the weekend had led me to forecast a major quake or volcanic eruption in the area on Saturday or Sunday. 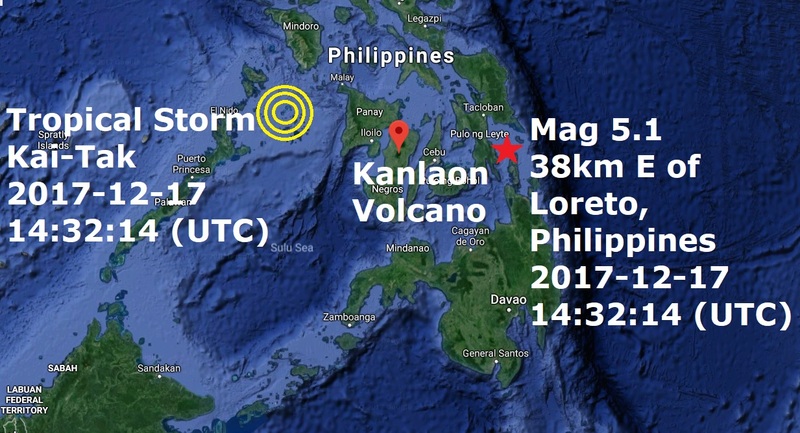 I was almost on the money, but not quite, as the tropical storm, Kai-Tak raged at 14:32 (UTC) a mag 5.1 quake struck just west of volcano Kanlaon, earlier two mag 4.7's also hit the area as the volcano continued to show activity, you can see the prediction here. It was a sad weekend in the Philippines, at least 30 people have died as a result of landslides caused by Tropical Storm Kai-Tak, the state-run Philippine News Agency (PNA) reported Sunday. Another 24 people have been reported missing, the news agency said. The deaths occurred in the Biliran Province, PNA reported. The storm has caused massive flooding that has destroyed bridges, leaving several towns isolated. Your earthquake predictions will get better if you check out Dutchsinse on Youtube. Study his technique which has resulted in very high accuracy. Download like I did the free earthquake reporting app/program which is mentioned in his link section below the video. I find it very interesting to check it every few days.